Advanced Placement is a program run by College Board (the makers of the SAT) that allows you to take courses right in your high school that can earn you college credit and/or qualify you for more advanced classes when you begin college. AP courses challenge students with rigorous course work that is at the college level while they are still in high school. The College Board monitors each of these courses carefully to ensure the AP Classes here at North Salem are providing rigor and a true College curriculum experience. The result is a curriculum that engages students and encourages problem solving and analytical thinking skills. Students taking these courses create a motivated environment that is characterized by in-depth discussions and intellectual investigation. In May, the College Board offers examinations in each of their AP subjects. These exams assess knowledge in that specific content area and are scored on a scale of 1-5. Students who earn a score of 3 or above are eligible to receive college credit for that course. Depending on the University a score of 4 or 5 maybe necessary to get credits. The earlier the Better taking AP in 10th grade. 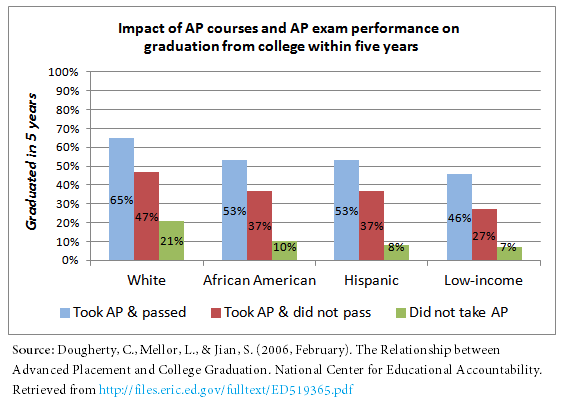 Are AP students more likely to Graduate from College on Time? Talk with teachers and your school counselor about getting into AP courses. North Salem offers a number of Honors classes that better prepare students for the rigors of college level courses. AP courses are for students who want to challenge themselves and be college ready. It is suggested that incoming freshman interested in AP courses take Honors classes first, to prepare themselves for the rigor of AP courses. Courses Advanced Placement courses often come with a common misconception—that they are only available to high achieving students. The reality is that any student can enroll in an AP course regardless of physical or mental blocks that the student might feel may be preventing them from taking AP. Since AP is geared toward preparing students for college, all students interested in attending a college or university should really consider taking an AP course. AP classes look great on college applications, earn you college credits, build college skills, and allow you to skip the introductory classes in college. Students must decide on whether or not their schedules can accommodate the rigorous study, time, and dedication needed to take an AP course.